“I go from these intense periods of creativity to intense phases of execution,” Leah Guadagnoli told me when I visited her sunny Brooklyn studio a few weeks ago. I can tell by all the paper diagrams, full of numbers and geometry formulas, as well as the many elaborate pieces on the wall, that she is serious about that statement. I found Leah, or better said, her work, in her first solo show in New York at 247365 in the Lower East Side this past January. I was immediately drawn in by the large irregular shapes, which curiously conveyed so much balance regardless of the fact that no two components of one single piece were equal. 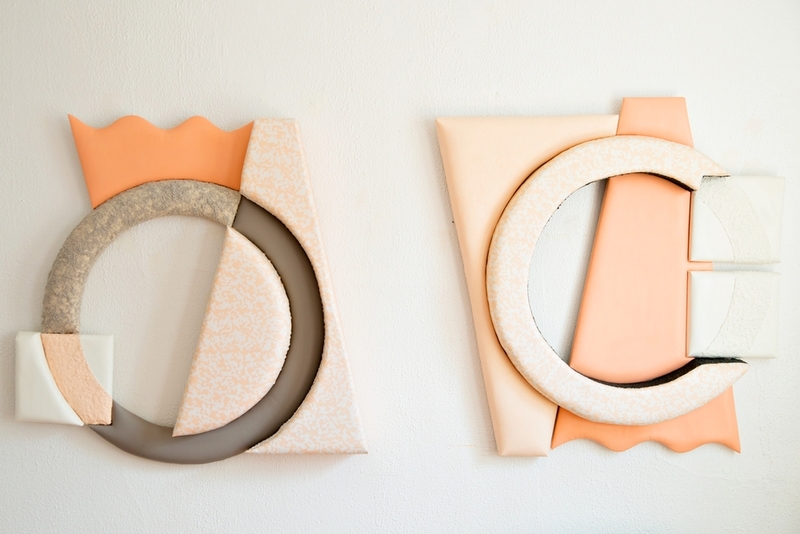 Leah’s work is inspired by textiles, interiors and geometric shapes. It is visually compelling and intriguing to those who look from afar, as they have to come up close to get a better idea of how these works are produced. The "intense creativity phase" begins with Leah investing her time in creating sketches and drawings of what she wants to make and inputting all the numbers, formulas and measurements. She then goes to her archive of vintage fabrics and other materials and chooses color combinations that suit her piece. She is always gravitating toward prints that resemble those in the rugs or upholstery of casinos, airports or hotels, which oftentimes are chosen to disguise stains and to hide the sins of guests and passersby. Next is the "execution phase," where Leah cuts the wood boards, fabrics, foam, orange peel wall texture, vinyl, and anything else she wants to incorporate and starts giving real shape to her sketches. She paints over several areas with oil and acrylic, creating either super smooth or super rough surfaces. The results are bold sculptural paintings that are unique, eye-catching and authentic. After meeting Leah and getting to spend time with her, I confirmed that her vision and the resulting pieces are quite strong on their own to the point that many galleries invited her to have her work displayed in current group summer shows, including Danese Corey and Asya Geisberg. Because so many people are becoming jaded and tired of the same old artists' tricks, Leah counteracts this fatigue with her fun personality, articulate speech and distinctive style - filling a void between the flatness of a canvas and the three-dimensional aspect of sculpture. Taking careful consideration between negative space and each of the individual shapes that form her own pieces, her fresh take on patterns and mixed media makes her work a winner. I'm excited about her upcoming works and that she will start designing her own fabrics and patterns instead of looking into existing vintage ones. I'm also excited about the prospect of seeing her career unfold, as she's just getting started, having recently completed her MFA at Rutgers University in 2014. In my book, Leah really is one to watch.